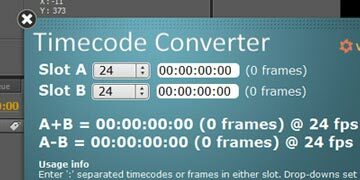 A complete, free, cross platform time code converter and calculator based on Adobe® Air™'s framework. At a glance: what is this timecode thing? A simple, free, cross platform time code converter and calculator. It is based on Adobe® Air™ framework, so it works on Mac, Windows and Linux. It has an unobtrusive custom chrome, and can handly be floated over your compositing or editing app for a quick computation. This calculator can also be used to compute durations (i.e. In and Out points) by entering in slot B a value larger than the one in slot A. The difference field will then display the duration instead of a negative Timecode. You don't have to remember anything about this calculator. No manuals to read, no help to be opened. A feature summary is always displayed in the custom chrome, just below the slots, and that's it. Update for Linux users: as of June 14th 2011, Adobe has discontinued support for the Linux framework. This Timecode Calculator should still work with the last released version of Adobe Air for Linux. This is copyrighted freeware provided with absolutely no warranty. You are welcome to use it as you see fit, both for personal and commercial work. You can not sell, rent, lease, redistribute or modify it. Please report any bug, issue or feature request in the comments section at the bottom of this page. This is an Adobe® Air™ application. If the framework is not already installed in your system, the download button below will install Adobe® Air™ as well. Reply from staff Hi, set the frame rate to 30 in Slot A, then enter the frame amount in the numeric field. Press enter and frames will be converted to timecode. Hope this helps! Hi, I would love to download this converter, but even with all the right stuff installed I can't seem to get the download link with any web browsers? Reply from staff Sorry, this issue seems to come and go. So far it seems to affect only Firefox. Please make sure you are running the latest Flash Player and if you are using Firefox update Flash Player every time Firefox tells you to do so. Hope this helps. Your opinions and suggestions are always welcome. Feel free to leave a comment. Limited tech support for free content may be provided here. Tech support for premium content is handled with the trouble ticket system in your Dashboard.